In just six months, the people of Scotland will vote in an historic referendum that could result in their country regaining independence after more than 300 years. A history of occupation over the past two centuries has given the Poles a profound sympathy with those fighting for freedom and independence, but the links between Poland and Scotland go far deeper than romantic sentiment. One of the greatest figures in Scottish history, Charles Edward Stuart, better known as Bonnie Prince Charlie, who led an ill-fated attempt to regain the British throne for his family in 1745, was half Polish. His mother was Maria Klementyna Sobieska, the granddaughter of Polish King Jan III Sobieski. But the blood-ties between Scots and Poles are far more extensive than this royal link. A long history of Scottish migration to Poland, starting in the 15th century, means the country boasts several villages and districts named Nowa Szkocja or Szkocja (New Scotland), and Polonised Scottish surnames are surprisingly common – MacLeod became Machlejd, for example. Scottish merchants and craftsmen began arriving in Poland in the 15th century. They were welcomed and encouraged to trade in Poland and the religious tolerance of the Polish-Lithuanian Commonwealth made Poland an attractive place for Scots of many denominations to establish themselves. 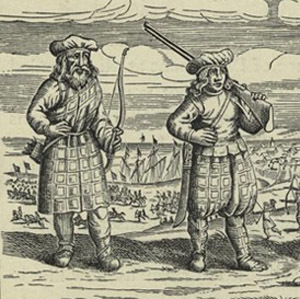 Scottish mercenaries fought on both sides during the Polish–Swedish Wars of the 17th century. 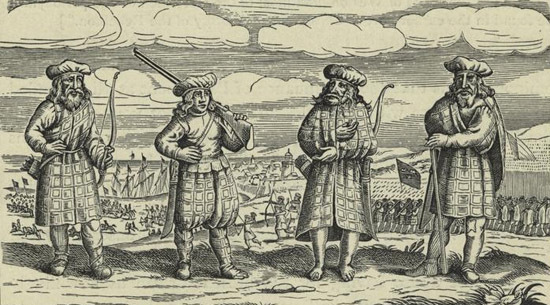 Many Scots prospered in Poland and some managed to rise through the ranks to notable positions. Under King Stefan Batory, Scottish merchants became suppliers to the royal court in Krakow and one Scot, Alexander Chalmers (known as Alexander Czamer) became Mayor of Warsaw four times between 1691 and 1702. A plaque commemorating him can today be found in Warsaw’s Old Town at his former home. Centuries later, Polish-Scottish links were refreshed when Polish forces found themselves in exile on Scottish soil during World War II. In 1940, after the fall of Poland to the Nazis, the Polish army was forced to regroup. In agreement with the Polish government in exile, many soldiers were sent to eastern seaboard towns in Scotland where they were entrusted with helping to defend the Scottish coastline from possible invasion. It is estimated that around 38,000 Polish soldiers arrived in Scotland between1940 and 1944, and many choose to stay after the war rather than return to a Soviet-occupied Poland. One of these soldiers was Cracovian Jan Tomasik, who was stationed near Barony Castle in Peeblesshire during the war. Many years later, he bought the place, opened a hotel, and embarked on an extraordinary tribute to his adopted country – a giant, three-dimensional map of Scotland moulded from concrete. 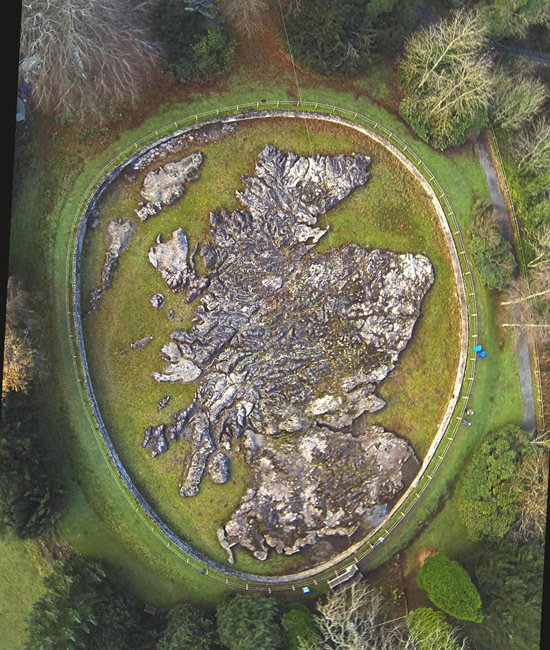 Known as The Great Polish Map of Scotland it measures 50 metres by 40 metres and is the largest sculpture of its kind in the world. Work on the map began in 1974 after Tomasik approached Professor Mieczysław Klimaszewski at Krakow’s Jagiellonian University with his idea. Design and construction was led by another Cracovian geographer, Kazimierz Trafas, and volunteers from the Jagiellonian University who came to Scotland over six summers to complete the map. Forty years later, and with another flourishing of Polish-Scottish relations underway thanks to the migration of many young Poles to the UK, the Great Polish Map of Scotland has been ‘rediscovered’ and a group called Mapa Scotland are now engaged in a major restoration project (www.mapascotland.org). The Scots’ hospitality to the Poles during World War II was notable. It was noticed that among the Polish soldiers arriving on Scottish shores from 1940, many were doctors, professors and students of medicine. Poland’s universities were being destroyed by the Nazis and its intellectual elite sent to concentration camps at the time. Edinburgh University decided to step in to help Polish soldiers continue their studies, and so the Polish School of Medicine at the University was born. The faculty operated from 1941 to 1949 and was the only official Polish institution of higher education in the world during the war years. The story of Wojtek the soldier bear provides another link between Poland and Scotland. A 230-kilo Syrian Brown Bear, Wojtek became the mascot of Polish military units in Iran during 1942, and was officially drafted into Polish II Corps as a corporal in order to secure him passage on a British troop ship bound for the Italian campaign. Beloved by his human comrades in arms, Wojtek learned to drink beer, smoke cigarettes and tote artillery shells in combat – a role he performed during the Battle of Monte Cassino. And the Scottish connection? After the war, part of Wojtek’s unit was demobbed there. Wojtek became a local celebrity in his new home of Hutton in Berwickshire, but in 1947 he was re-homed to Edinburgh Zoo where he lived until his death in 1963, regularly visited by Polish veterans. Statues commemorating the warrior bear have been approved for Edinburgh’s Princes Street Gardens and Krakow’s Jordan Park. It is hoped that the Edinburgh monument will be unveiled on May 18, 2014 – the 70th anniversary of the end of the Battle of Monte Cassino. Funds are currently being raised for the statues in both cities. In recent times, the connection between Krakow and Scotland has remained strong. Krakow has been twinned with Scotland’s historic capital, Edinburgh, since 1995 – a partnership that has yielded benefits to both cities, including closer cooperation between the University of Edinburgh and Krakow’s Jagiellonian University. The Polish presence at Edinburgh’s famed Fringe Festival grows every year and Scottish culture is evident in Krakow, especially around the time of Burns Day and St. Andrew’s Day. Excellent, interesting article. I sat and read the entire article. I second the above comment – great article. Another Scottish/Polish connection is the visit in 1848 by Fryderyk Chopin. He was invited by the sisters Jane Stirling and Katherine Erskine, was treated handsomely wherever he went and played concerts at Edinburgh and Glasgow where he was enthusiastically received. “Hassling-Ketling”? You’re kidding. What sort of a Scottish name is that? Arch, I could post the Wikipedia link to Hassling-Ketling, but the trouble is, the entry gives away too much of the plot of the book. I’d say take it up with Sieńkiewicz, except he hasn’t been around for a while. he was a POLISH SCOT,, he came to Scotland to live, he was one of us. i am part Scott,part Irish,English,and my grandmother was Welsh.My children are half Polish and half British and that is the way i want it to stay. I was on a short trip in southern Scotland last year (primarily Edinburgh & The Scottish Borders) and absolutely loved it. The view from Arthur’s Seat on the castle & city of Edinburgh, or beautiful scenery seen from the Scott’s View rising above the River Tweed, is something we shall never forget. By the way, is the name/family Butler of Scottish origin? If so, some members of the Butler family seem to have moved to then Courland (now Latvia) in 16th century, which was part of the Polish-Lithuanian Commonwealth, and then gradually settled down in the Kingdom of Poland. Their noble status was officially recognised (by way of so-called “indygenat”) and the family’s coat of arms was accepted into the Polish roll of arms. Franek, I think they might have been Hiberno-Normans, eg. of Norman origin but from Ireland. They are listed in Volumina Legum and in publications about British and Irish soldiers getting proof of their nobility (indygenat) in Poland. Remember reading that one of Butlers recruited Irish soldiers for Poland in Ireland, with the blessing of James I who was probably more than happy to get rid of the rebelious subjects. Butler is a surname historically associated with Ireland. One shouldn’t be too surprised if an Irish Catholic named Butler went to study in Poland and ended up staying there. In 1974 I was participant in the Student Summer Session at the Jagiellonian University in Krakow, and I fondly remember that prettiest of the Polish student guides in our group was named Maria Gordon. I attended the 1974 Summer School of Polish Language and Culture as an exchange student from St Andrews University. I will be back in Kraków in August and I would be interested in meeting up with any of the student guides still living in the city to discuss then and now. I’m afraid the only name that has stuck in my memory is also Maria Gordon. Gordon is a name associated chiefly with Aberdeenshire which was historically dominated by Clan Gordon. Many people from that district lived in Poland in the 17th century. You may find the career of Patrick Gordon an interesting read (look him up on the English Wikipedia). Good article. I had occasion to pass the Polish service graveyard in Perth today. A poignant reminder that war seems to have played a significant role in the good relationship between Scotland and Poland in the past. I am very happy to note that the exchange between our countries is greater in peacetime. That implies that the Scots didn’t instigate the Union, whereby the Scottish King took over the English throne. Peter the 1603 union was hardly at Scotland’s request, it was simply the laws of succession. It hardly amounted to a Scottish takeover of the government, in fact it probably gave Scotland less power, as it now became essentially an after-thought to a new breed of absentee London based kings and aristocrats. The Anglo-Dutch Wars and Darien Scheme are perfect examples of these so called ‘Scottish’ kings acting entirely contrary to Scottish interests to promote the interests of their largest realm, England. As for the political union of 1707, I really recommend you read Michael Fry’s book about the Union. This union had massive, overwhelming opposition from the Scottish population. England’s own spy in Scotland, Daniel DeFoe, said that “the whole nation appears against the union”. In fact I would argue that there has never been a time in Scottish history where the population has been so united in one opinion as they were in their opposition to union in 1707. A joke of the time said that it was the only time in Scottish history that you could find a Catholic Priest, an Episcopalian Prelate and a Kirk Minister all in agreement. Voluntary? When only the aristocracy and landowners got to vote on it. The common people were overwhelmingly opposed and sought to lynch the commisioners who fled from the scene. Interesting article.migration to Poland by Scots and vice -versa. my son ‘s partner is Polish and they have a son. and as a Scot feel a comradeship and respect for the Poles. I have worked with many Polish people. we even have a shop owned by a Polish couple. Scotland is being robbed by London, in the last 30 years Scotland has produced more oil than Abu Dhabi and Dubai COMBINED !!! Yeah. And now we are the first country in world history to vote against THEIR OWN independence. What a shambles of a country we are. Forever ruled over by the English. The last slaves of the British empire. The British flag to me just represents oppression and a bloody empire built on hate and killing. It is rubbish being Scottish. Truly it is. A charming article & interesting read. As a Polish – American I notice a definite *pecking order* in Europe. We mainly hear about events concerning, England, France, Russia, Italy, Germany & of course *Brussels*. or *alter* what we have inherited from the European Civilization in an attempt to be *more inclusive* . Of course the definition of *inclusive* is what the Progressives determine. Nothing is open to discussion like Obama is fond of saying when he has a foothold, “the discussion is over” & of course, “the science is settled.” I never thought I d see the day my country would be over-lorded by a tyrant ! Thank heaven we can learn so much from the internet & reconnect with our roots ! Dzienkoye ! (?spelling ??) for all your efforts !! and this is related tot he post how? im no fan of Obama but really, you came here to bash him only. Along with the protection offered by King Stephen in the Royal Grant of1576 a district in Krakow was assigned to Scots immigrants. I would appreciate if you can tell me what the name of the district was that the Scots lived in Krakow or point me in the right direction to get this information. i couldnt agree more, most Poles are great people. i like living here, do miss Scotland tho. gutted i cant vote. would be a huge YES. Approximately 40 odd years ago a ‘Pole in Scotland’ or I should say a Polish man that lived next door to my family in Anderston Glasgow; saved my life…cant be bothered going into details but Eddie Anderston (yip Eddie Anderston from Anderston) i might not remember it happening but I’ll always be grateful you were here..
hi i am scottish and i voted for independence. very interesting artical i read the whole artical and the many comments . they are all positive and shows we to countries are friends in the world and its glad to study a friendship of two countries since 15th century, instead of reading and hearing about countries being enemies, in conflict or in war. i am sitting here with my friend and his polish girfriend who is pregant and its good learning about our contries in culture , magda and ian are going to name there baby jacob if its a boy as jacob is popular name in poland soo its fitting , and mia if its girl as its popular in poland so its fitting. It wasn’t just the Nazi’s who were destroying the Polish elite in WWII. The Katyn massacre is evidence that the Communists were also very much involved in this. I ve been living in London for 6-6yrs. Love it. But often go to Scotland and I have to say these people their music and landscape is outstanding its paradise on earth to me as I don’t like hot climate . Greetings to all Scots. At the age of 48 I always wondered how my father and his father who were born in Poland had a surname of Morton. After reading this article it now makes sense. Thank you for answering a question that has puzzled me my whole life. Have seen in a few articles that Cracow had a Scottish district for merchants.Can anyone verify which area this might have been? Many thanks. This is so interesting. My Polish father fought at Monte Casino, and he told us many times of the story of Wojtek the bear. Katy Carr sings a song about him. My DNA test shows I have 12.4% Irish, Scottish, and Welsh ethnicity..! I am of Scottish decent from the Isle of Colonsay and Glasgow. Not all the Poles are great people. At the end of the war after the concentration camps were liberated many Polish Jews returned to their homes only to be KILLED by their fellow Poles. This is well documented and I know Poles in Melbourne Australia who told me of this also. I’ve been lead to believe that the Gordon’s were instrumental in a battle in Poland in the past – and that’s all the information I have.